Purdue's executive education programs have provided opportunities for working professionals for more than 35 years through two degree programs: the Executive MBA and the IMM Global Executive MBA. You can complete your EMBA while remaining employed full-time and attend classes on campus just one to two weeks per quarter. It’s a format that gives you the best of both worlds – online convenience and the power of enhanced classroom learning and networking with other professionals from across the U.S. and world. All this in only 19 months. 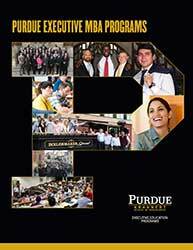 Purdue Executive MBA students have at least five years' work experience and an average of 14-16 years. They are professionals facing challenges similar to your own and representing a range of industries. They come from across the United States and around the world. This range of experience allows you to learn not only from world-class faculty, but from your peers as well. The program begins with a five-day launch week on Purdue's campus in West Lafayette, Indiana, followed by quarterly on-campus residencies spanning 19 months. Between on-campus residencies, students use online technology to prepare assignments, engage in discussions, work in teams, read ebooks, and watch instructor-prepared videos. The mix of online and on-campus learning allows you to participate from anywhere in the world without interruption to your career and home life. The one- to two-week quarterly residencies provide you with an extended opportunity to truly interact and work with the professionals in the program in a way not possible through evening or weekend MBA formats. Through class discussions, evening projects, social events, and company visits, your cohort members become your friends for life. You will graduate with a network spanning different continents, and lifelong friendships. Read on for help in deciding if a Purdue EMBA is right for you. to make the decision that’s best for you. • Resume review — Share your resume and we'll give our feedback regarding fit with the Executive MBA or IMM Global EMBA as well as a determination about a GMAT waiver. • EMBA program comparison — We’ll stack the Purdue EMBA and IMM Global EMBA programs up against as many as three other schools, and compare them along 23 key dimensions. For an example, click here to see a sample comparison. You choose the schools and we’ll email the report. • Webinar access — Get valuable insight into our programs and ask questions of our alumni and current students. Join an upcoming webinar. • On-campus EMBA Experience — Includes a complimentary stay at the historic Union Club Hotel at Purdue, program overview with Q&A, interactive EMBA class and lunch with current students. Find our upcoming open houses here. Can't make it to campus? Take advantage of a Virtual Visit! 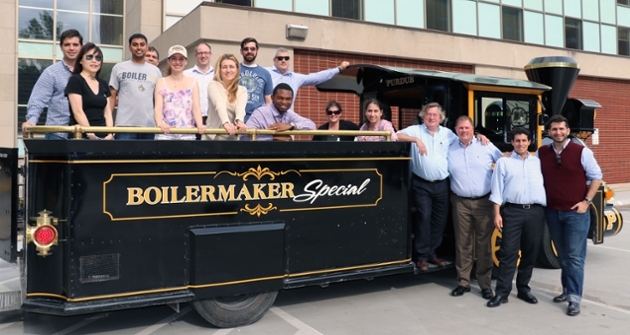 • EMBA on the Road — Meet one-on-one with a Purdue EMBA team member in cities across the U.S. and abroad. Get all your questions answered in a personal conversation.